Since its’ inception, Damaged Pies has played and recorded at some of the most legendary venues in world. From CBGB’s in New York City to the Whisky a-go-go in L.A., from Liverpool’s Cavern to Sun Studio in Memphis to Trident Studios in London, from Farm Aid Eve in Hershey to The Surf Ballroom in Iowa, from Damaged Pies Day in Pittsburgh to Toronto to Philly, from Athens to Boston, from Wrigley Field to Three Rivers Stadium from the Rock and Roll Hall of Fame to Golden Gate Park in San Francisco to the Wheeling Jamboree to Nashville and all points in between, Damaged Pies has been one of rock and roll’s most durable and well-traveled acts. Damaged Pies/ Steve Bodner has also been honored with the Jefferson Award for Public Service. 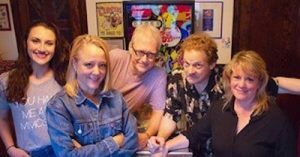 The Damaged Pies new single to benefit WhyHunger’s Artists Against Hunger and Poverty is entitled Same Circus, Different Town and features a musical introduction by David Hentschel (Elton John, Genesis, George Harrison and Ringo Starr). The Damaged Pies new album, The Stars on a Summer’s Night, is available now on Amazon, I-Tunes, CD Baby and Spotify and features cover art, And Blue by Bernie Taupin. One of the tracks, We Must Learn to Live Together features the words of Civil Rights Leader and Georgia State Representative John Lewis. The upcoming album You Can Lead A Horse to Water features a cover photograph by Lynn Goldsmith. Musicians for Hunger Relief’s new song, Louder Than Concorde features Rock and Roll Legends Adam Marsland (The Beach Boys, Wilson Phillips), Spooner Oldham (Aretha Franklin, Crosby Stills, Nash and Young, Percy Sledge) and Caleb Quaye (Elton John, Hall and Oates). Damaged Pies has opened for former Beatle Pete Best, Marshall Crenshaw, Alejandro Escovedo, Pegi Young (Neil’s wife), James McCartney, The Atomic Punks, Peter Case, former Eagle Don Felder, Peter Mulvey, John Hall (Orleans), Wayne “The Train” Hancock, Eric Sommer and Jen Chapin. Damaged Pies is a member of WhyHunger’s Artists Against Hunger & Poverty, The Recording Academy, Pittsburgh Legends Awards and ASCAP. 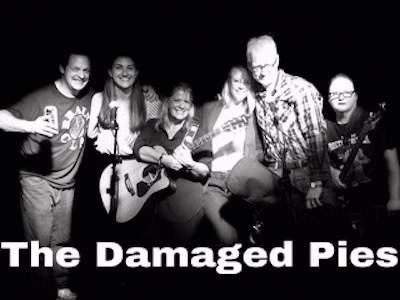 Damaged Pies also founded Pittsburgh Musicians for Hunger Relief. The Damaged Pies Steve Bodner is also a District Advocate Team Captain for The Recording Academy/ The Grammys and Farm Aid 2017 Homegrown Prosperity, Hope Grows Here events. Damaged Pies movie Same Circus, Different Town is available on You Tube.